I pretty well love this idea for when I have my own chickies some day. 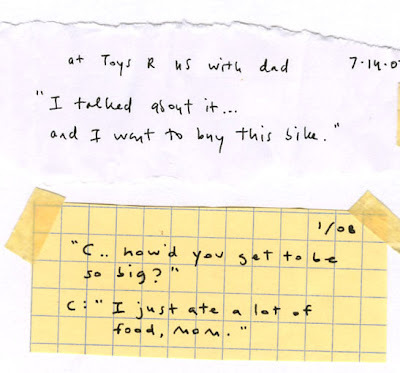 when I read about this awesome idea, it made me think about my own mother's little notes. she had small books that she kept in her nightstand where she would write out snippets of cute things we said or did that day. being the 10th of 11 children, I kind of got the short end of the stick on that one (meaning she stopped at around age 8), but she did manage to write some funny things from when I was a bitty girl. one of my favorites: when I was (let's say 4) my older sister, diane, was attending college in utah. one day, I heard someone talking about her coming home and asked, "is diane in me-tah?" everyone laughed so I said, "elizabeth-tah?" let's be honest, I was a fantastic child. p.s. david and I are off to california for the weekend but I'll be posting next week about the amazing mexican fiesta we are having tonight in celebration of marcus' return home from germany/austria! yee haw! I mean, "feliz dia!" 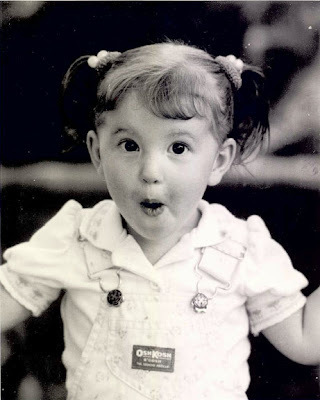 No doubt you were a fantastic child, because you are an AMAZING adult. We will be awaiting your post of all the fun. Oh Liz, I just love you, LOVE you. Seeing you the other day just made me so happy and I just want you to know how much of an influence for good you have. You really do inspire me to handle the negative a lot better than I have been. Thank you, seriously. You guys are always on my thoughts. I love that idea! I know how you feel. I am the youngest of only 3 and I don't have much on my childhood. I am so going to copy that idea. And can I just tell you that I love your blog. You have such great taste, and your funny. I am keeping journals of each of my kids. My oldest is eight, so I will try to remember that after eight is still very important for those books!!! I am pretty thrilled with what I have thus far. And Liz, having been your elementary school computer teacher for a couple of seasons, I thought you were an absolutely darling fifth and sixth grader. Cute picture! It was lovely to see you at the Hope Concert the other day. I am enjoying your blog. I love this idea...similar to a christmas gift we gave my mom a few years ago. 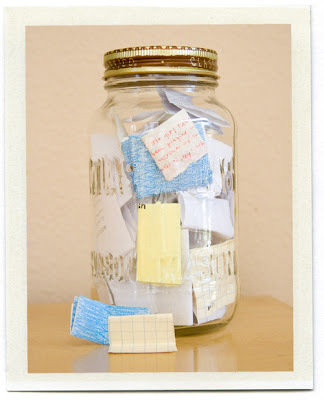 It was a memory jar. My siblings and I each wrote down memories from our families lives. Then I made sure we did not have duplicates, printed them out on 365 colorful sheets of paper, folded them and put them in a jar. She got to open 1 a day for a year - then she would email them to us so we could share too. It was a great present - only problem is that we can never top it now!